Background: Coronary heart disease is the leading cause of mortality and morbidity, incurring a major burden of medical care. Even with increasing application of emergent recanalization (PCI and CABG) therapy, ischemia and ischemic reperfusion injury remain as the dominant pathological process that damages cardiomyocytes. Mitochondrial Aldehyde dehydrogenase-2 (ALDH2) is a multifunctional enzyme catalyzing the oxidation of aldehydes. Objective: Accumulating data have shown that ALDH2 can help restore mitochondria function by eliminating toxic aldehyde and participating in cellular signaling important for cell adaption and survival. 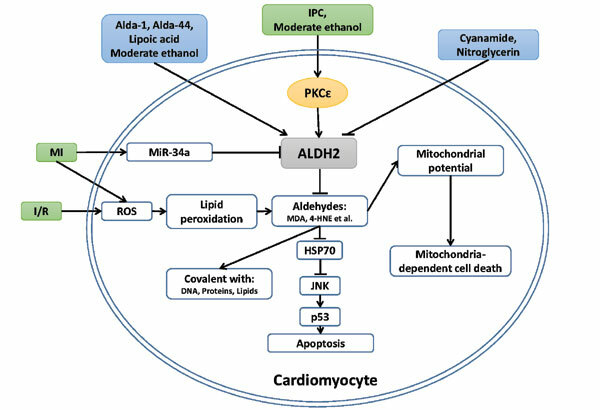 This article reviews the biology and pathobiology roles of ALDH2 in the ischemic cardiovascular disease, focusing on the genetic evidence associated with the oriental patients. Conclusion: The ALDH2*2 mutant allele (deficiency genotype) is present in nearly half of the East Asian population. Development of a safe way to restore ALDH2 function in this population thus has unique clinical implication. Keywords: ALDH2, enzyme, ischemic heart disease, mitochondria, polymorphisms, cardiac injury. Keywords:ALDH2, enzyme, ischemic heart disease, mitochondria, polymorphisms, cardiac injury. Abstract:Background: Coronary heart disease is the leading cause of mortality and morbidity, incurring a major burden of medical care. Even with increasing application of emergent recanalization (PCI and CABG) therapy, ischemia and ischemic reperfusion injury remain as the dominant pathological process that damages cardiomyocytes. Mitochondrial Aldehyde dehydrogenase-2 (ALDH2) is a multifunctional enzyme catalyzing the oxidation of aldehydes.